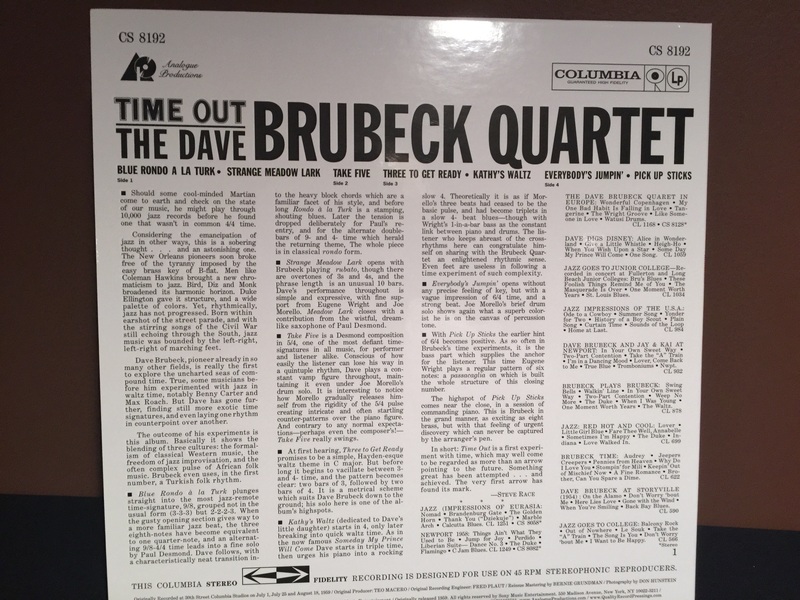 A Comparison Of Eleven Versions Of Dave Brubeck's "Time Out"
According to the www.discogs.com website, there are 131 versions of "Time Out" spanning LP, CD, SACD, and digital download media. The original release date of this recording was December 14, 1959. 1. Classic Records 4 LP (one sided discs) - 1995 release. 2. Analog Productions 2 LP - 2014 release. 2. Analog Productions SACD - 2012 release. 2. Analog Productions DSD download - 2012 release. 2. My DSD rip of the Analog Productions SACD to a DSF file. 3. Columbia, Legacy LP reissue - 2008 release. 3. Columbia, Legacy SACD - 1997 release. 4. My 44.1 kHz/16 bit rip of the 1997 Columbia Records "20 bit" CD. 5. My CD-R copy of the 1997 Columbia Records "20 bit" CD. 6. Columbia, Legacy CD - 1997 release. 7. Columbia, Legacy FLAC file download, 176.4 kHz, 24 bit - 2013 release. Figure 1. 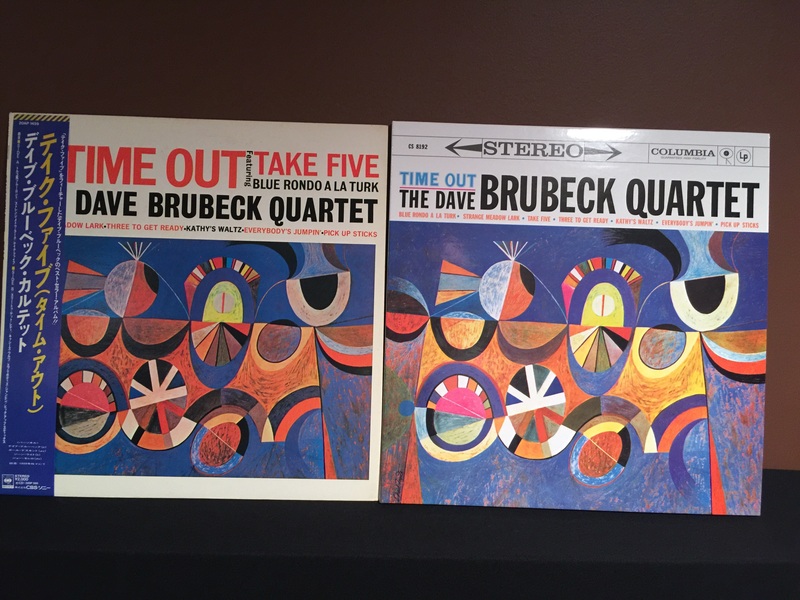 Top to bottom: Audiophile pressings of Dave Brubeck's "Time Out" - Sony/BMG 180g 33.33RPM (2008), Analog Productions 200g 45RPM 2 LP set (2012), Classic Records 180g 45RPM 4 LP set (1995). The Classic Records 4 LP 45RPM version is spectacular in every stereophonic aspect: image weight, depth, image size, clarity, detail, tonal balance, bass articulation, bass weight, everything. The Analog Productions 200g 45RPM 2 LP set is great and my trusty old single-disc 33.33RPM 180g version can only look at the 45RPM versions and see what it wants to be when it grows up. Figure 2. Clockwise form top left: Analog Productions SACD, Columbia, Legacy SACD, CD-R copy of Columbia, Legacy CD, Columbia, Legacy CD. At bottom, USB drive containing downloaded and ripped versions. The best sounding of the eleven is the 4 LP set. A four way tie for second place consisted of the Analog Productions LP, SACD, DSD download, and my rip of the Analog Productions SACD. The Analog Productions LP, SACD, and DSD download were produced from Bernie Grundman's remastered tapes. Tied for third place were the Columbia, Legacy SACD and LP, which were mastered by Mark Wilder. I was surprised that the Columbia, Legacy FLAC download, obtained from HDTracks, was the poorest sounding of the group. The Classic Records 4 LP set is the best sounding recording I own in any format. It produces the heaviest and most three dimensional images, the most articulate and detailed bass, and the most clearly defined and sharply localized ambient and reverberant information. Compared to the other versions of this recording, these qualities diminish as I move down the rankings. 1. Classic Records original reissue 45RPM 4LP 180g (1995). 2. Classic Records second reissue 45RPM 4LP 200g (2000) on proprietary Quiex SV-P vinyl. 3. Classic Records third reissue 45RPM 4LP 200g (2008) on proprietary Clarity SV-P II clear vinyl. 4. Analog Productions first reissue 45RPM 2LP 200g (2012). 5. Analog Productions second reissue 45RPM 2LP 200g (2014 - High quality gatefold jacket). All of the above 45RPM versions were produced from the re-master tapes produced by acclaimed recording engineer Bernie Grundman and his signature is engraved in the leadout space. Analog Productions acquired Classic Records in 2010. 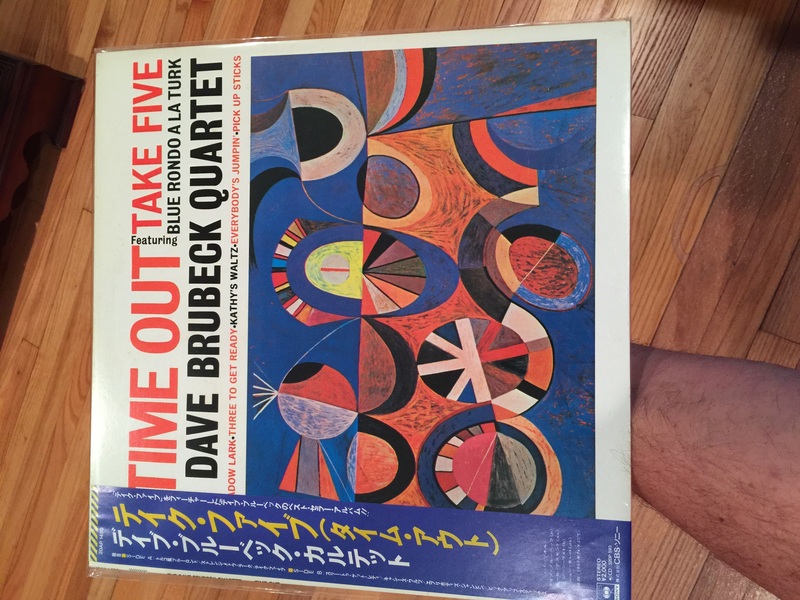 I assume that they did not do a 4 LP reissue of "Time Out" due to cost. Classic Records charged $50 for the 4 LP set in 1995 (equivalent to $80 in 2015 money). They probably would have had to charge around $100 for a 4 LP set. 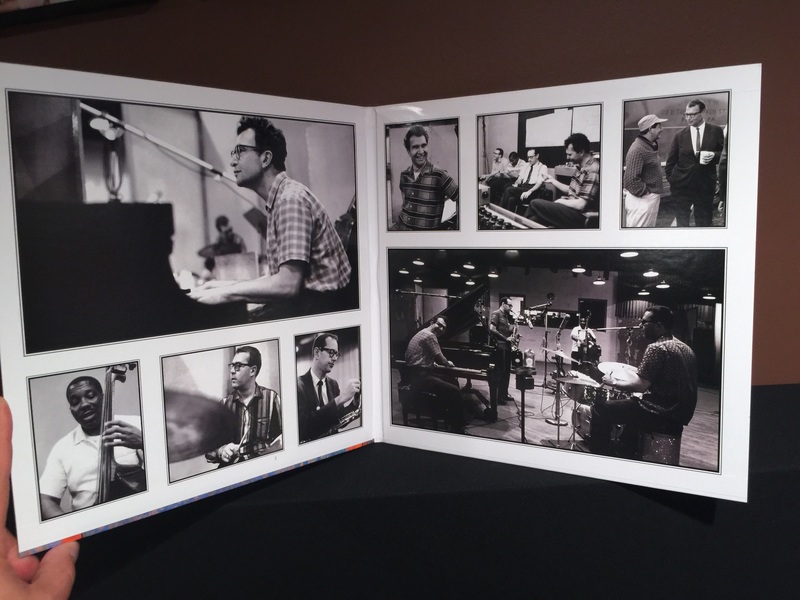 The 2 LP set costs $50. 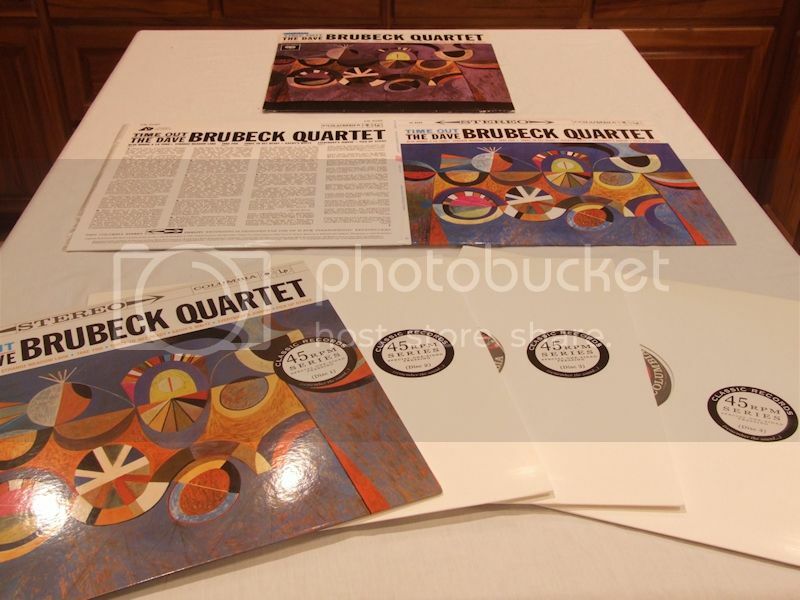 I found a used copy of the 4 LP set for $112.50. The jackets of the 20 year old used 45RPM set looked like new. One of the inner sleeves (which I always throw away anyway) was ripped. Acoustic Sounds (which is also owned by Analog Productions) says that used records are cleaned before shipment. There were some specks of dust, but the vinyl was glossy-black and there wasn't any surface noise. Discs 1-3 each had one very light scratch probably caused by a stylus skipping across the record surface. Steam cleaning, wet cleaning, and vacuum cleaning the discs did not produce any audible difference or improvement. The new 2 LP set was spotless and had no surface noise. Further steam/wet/vacuum cleaning did not produce a difference or improvement in sound quality. I wish I had been paying more attention to what was going on with new vinyl reissues. I missed out on some exceptional audiophile-quality releases. Everything I missed is still available, but those records are out of print and exist only on the collector's market for high prices. I was lucky to find a used "mint-minus" copy of the "Time Out" 45RPM 4 LP reissue for "only" $112.50. Like the CDs, SACDs, and LPs that preceded them, high resolution digital download files are hit or miss with regard to recording quality. The prices are also high, unless you catch a sale. Since downloads cost more than their CD and SACD counterparts, it is usually cheaper to buy the CD and rip it rather than taking a chance on a hirez version may offer no, or marginal, sound quality improvement over the CD. Most people don't have the facility to rip SACDs, therefore, if they want a DSD file for their music server, they have to buy a DSD download. Fortunately, I am not plagued by that unfortunate circumstance. Going forward, I don't plan to buy any more hirez or DSD downloads, unless the music is only available in that format. I'd rather buy the disc and rip it to my music file server. Figure 3. So beautiful, yet so barbaric. I wish I knew how to quit you. I'm looking forward to the day when my turntable is obsolete. I've long been tired of making music by dragging a tiny polished rock through microscopic plastic grooves prone to trapping dirt and dust. I don't want to wash, steam clean, and vacuum another record. I don't want to go to the turntable every 22.5 minutes to change sides or change records. CDs and SACDs, while not as barbaric as vinyl, do not offer the modern conveniences that a high end server-based computer audio system does. But there's light at the end of the rabbit hole. The days of having to spin little silver discs are over in my two channel system. This liberation will eventually expand to my other audio systems, even to the ones in my car and truck. After all that, I can liberate my home theater system from those little silver discs with a nice video server system. I feel like Neo in The Matrix. I thought I was bad having 6 versions of Brother In Arms on the little silver discs, which I'll never stop spinning. You don't do LP's, do you? If you have the chance Ray, I would be interested in your comparison of the 24Kt. gold Columbia disc (unless the CD-R copy is the 24 Kt. Gold disc) and the XRCD of Time Out. I do not own nearly as many copies of the album as you. I have yet to buy the Analog Productions SACD, but with your prodding, I will now do so. I'll toss on the Jazz Wax Records Stereo 180 gram 2010 version from Spain while reading this. It says on the advertising sticker "newly remastered" and one pressing. "Like the CDs, SACDs, and LPs that preceded them, high resolution digital download files are hit or miss with regard to recording quality." I woke up to this a few weeks ago. Deserves repeating. "Going forward, I don't plan to buy any more hirez or DSD downloads, unless the music is only available in that format. I'd rather buy the disc and rip it to my music file server." I wouldn't go that far. but I'm seeking out SACDs, Made in Japan rebooks, and of course vinyl. The exchange stores have woke up to this and are charging a buck or two more for these. Was picking them up for $2.50 - $6.00 for a time. My Jazz Wax is a Direct Metal Mastering on a original George Neumann cutting system and sounds F-ing great. I was so Jazzed to the quality of the Timeout disc that I ran back out and picked up John Coltrane 'Lush Life' and 'Mingus Ah Um' Jazz Wax DMM as well. Equally high quality IMHO. Think I'll spin these. Thanks DK! You seriously ROCK I glad you like the Analog Production ones! but I see you still prefer the 4 LP version and I am glad you found a copy of the 4 LP version. Hi, Played only once cos I prefer my Vinyl version. In pristine condition." 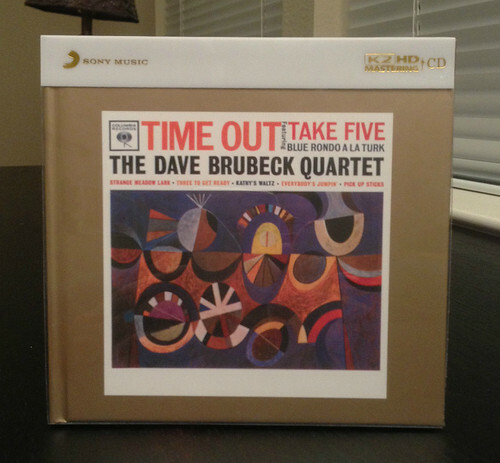 Seeing as how I've already helped put Dave Brubeck's grandchildren through college, I don't think I'll be buying any more "Time Out" versions. This especially applies to the CD versions. I remember when the much higher priced "Gold" CDs came out with their promises of better sound and longevity. I wasn't into high end audio then, so I passed. I thought they were pretty though. It appears that all the talk of "digital rot" and "oxidation loss" pertaining to the reflective aluminum layer of "ordinary" CDs was marketing scare tactics. I have CDs 25+ years old that look and play just fine. They definitely made some spectacular ripped digital copies. We'll see if my CDs rot and oxidize while stored in my attic over the next 25 years. HDCD is theoretically superior to XRCD because HDCD uses additional hardware to process the additional 4 bits of information in a 20 bit master. This is in contrast to a 20 bit XRCD or 24 bit K2 XRCD that is made by down-converting a 20 bit or 24 bit master to 16 bits. My Cary CD 306 Pro Version SACD player decodes HDCD discs. I do not have a regular Redbook version of Time Out to compare to the HDCD (and SACD) versions. I can say that my 16 bit CD-R copy of the 20 bit HDCD sounds better than the HDCD and my 44.1 kHz/16 bit ripped FLAC file of the 20 bit HDCD sounds better than both the HDCD and the CD-R. Also, upsampling the HDCD from 44.1 kHz to 192 kHz on the CD 306 resulted in better sound. However, again the CD-R and ripped FLAC file sounded better than the upsampled CD. Ray, would you mind sharing your preferred 'rip to FLAC' approach? What software and settings do you use to get to the point where the end result is acceptable to you? I use dBpoweramp CD ripper ($39 single PC license, $58 2-5 PC license) to make a bit-for-bit lossless uncompressed FLAC file. I don't do any digital processing of the file to alter it in any way. Thanks for the review. I have to say that's a lot of copy's! I have only one copy the Analog Productions 2 LP 45's. So since I don't plan on seeking out a copy of the Classic Records 4 LP (one sided discs) - 1995 release. How close in sound quality would you say the Analog 45's are to the Classic's? I have missed these posts! Great read!! If the Classic Records 4 LP set is rated at a "spectacular" 10/10, the "great" Analog Productions 2 LP set would be 8/10. The 4 LP set provided more of an illusion of live performers in my living room. The 4 LP set sounds more dynamic with significantly more bass detail and articulation. Bass notes requite wider grooves and the grooves could be spaced out more with 4 sides. Less equalization was required to size the grooves to fit into a more confined space. The 4 LP set sets up a sound stage with very clearly defined boundaries. I could "see" where the "walls" were as sound reflected off the sides, rear, and even the ceiling of the sound stage. It was as if a room had been created around me. The 4 LP set is more holographic and three dimensional with a greater sense of space between images and more of a sense of the images themselves being solid three dimensional objects. This was particularly true of Dave Brubeck's piano, which was the largest sound image. It was easier to hear sounds coming from different parts of the piano. All instruments had micro-details that I had not noticed before, such as the different reverberant envelopes of individual bass notes, more "brassiness" and "reediness" in the alto saxophone, and more "skin" sound from the drums. That's a big step up from the Analog Productions 2 LP 45's. I found a sealed Classic 4 disc copy on ebay for $244.99 but I think I'll stick with what I have. Thanks again! 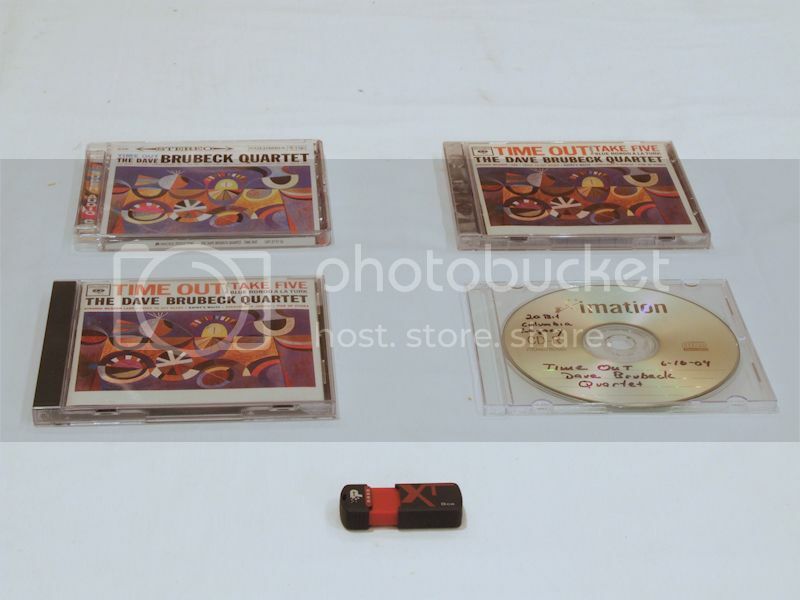 I don't think there is a XRCD version of "Time Out". Of course, I could be wrong. However, there is a K2HD version of "Time Out" that was pressed in Japan and released by Hong Kong Sony Music. It is highly regarded. Great information here. Heard this on album many times and have the CD. I do remember listening to "Take Five" on cassette back in the 90's. The guy who owned the system recorded it from his Dad's album to one of the better memorex tapes. Not sure what release? I think this was before '95? I really don't remember? Anyway, the deck was a Nakamichi Dragon and pre, monoblocks powering a set of Kef 107's. I was floored how good it sounded on cassette....I did not think it was possible. It almost sounded like an album and fairly quiet. I don't think I've ever heard cassette sound as good as that? Thanks for the review source Ray (regarding the XRCD (K2HD)). The one in Danny's picture is the one I was referring to in my question. From what I understand, the K2HD CD of Time Out would fall under the third category in your XRCD list, although it does not specifically list it as an "XRCD"; but it essentially is. I am getting in late to the party here. I only own 3 versions. The original 1959 lp, a regualr redbook cd and the legacy 2cd remaster. The original LP Even with a few pops here and there still sounds better to me. Didn't mofi or audio fidelity come out with one? I haven't done a shoutout between all the versions, I did compare the 2x45RPM versus the Japanese LP versions a while back but I can't recall the winner. I should really refresh my memory on that! The Japanese vinyl is a 1979 pressing, 20AP 1459. The 2014 release is the same pressing as the 2012 release, but in a heavier, higher quality gatefold jacket. There were some complaints about the packaging. Further down in my review I mentioned the difference between the 2012 and 2014 releases, but I should have explicitly stated that the pressings were the same and only the packaging material was different. Ah interesting. I definitely got mine earlier than last year, so I must have the 2012 version. Can't see why anyone could have complained about the packaging, it's a beautiful gatefold printed on high quality stock. In any case, it's the wax that counts! You've definitely inspired me to give Dave a spin! Would this be a worthy Contender? It says original recording on the lower left hand corner I have not found a picture on line of any that have that be it lp cd or sacd. It says made in the Netherlands # 709922 dated 2011. I found it at a garage sale still originally packaged. It sure seems that there are a lot of choices when it comes to this recording, and it does sound fantastic. 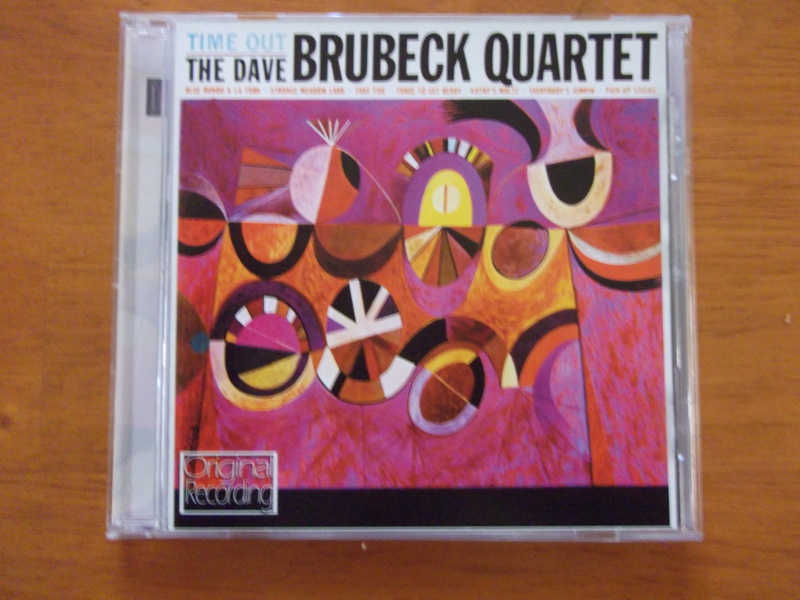 I received the Analogue Productions 45 rpm reissue of Dave Brubeck's "Time Out" this weekend, and it was very disappointing. Both discs were badly dished, and disc 1 was pressed off center so there is a lot (a whole lot) of wow. The piano warbling in and out of tune is not what one expects for $50. 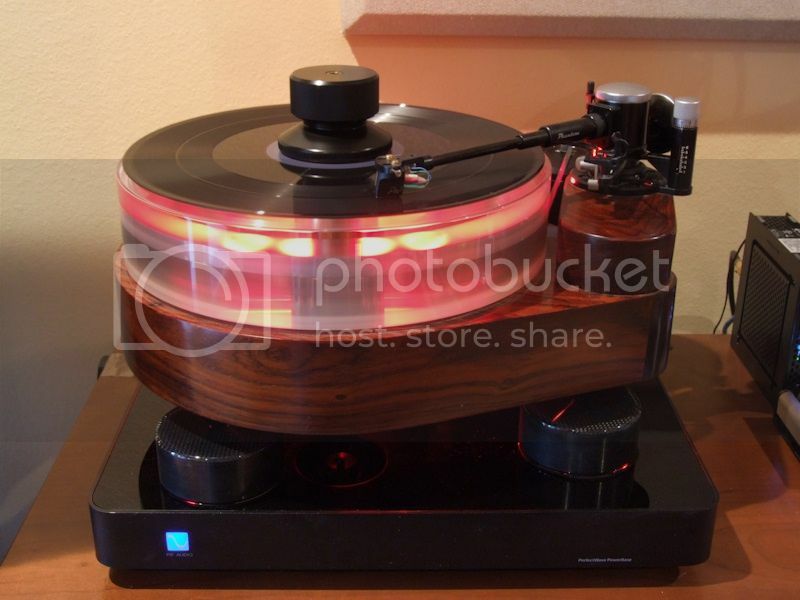 Also, after spending untold hours getting the azimuth right on a cart, to put a bowl-shaped record on the platter kind of defeats the purpose. It's nice that AP is at least making an effort to step up their game with the gate-fold jacket, yet it still doesn't have quite the printing quality and graphics reproduction of Music Matters. The colors on the iconic cover are kind of washed out looking, and the inner photos are lower resolution than you would expect. Would this be a worthy Contender? It says original recording on the lower left hand corner I have not found a picture on line of any that have that be it lp cd or sacd. It says made in the Netherlands # 709922 dated 2011. I found it at a garage sale still originally packaged. The notes for this version at discogs.org say that the mastering engineer was Mark Wilder and the copyright date is 1997. This version is probably sonically identical to the Columbia Legacy reissue that was mastered by Mark Wilder and released in 1997. I rated the 1997 Mark Wilder mastered reissue as 6th best out of 7. It sure seems that there are a lot of choices when it comes to this recording, and it does sound fantastic. Yes, www.discog.org lists over 140 versions of "Time Out". While I also have some CD's that are 25 years old (many, many "West German Target" CD's) I also have not experienced "digital rot" in my CD's as far as "traditional rot" goes. However, I do have a few older (i.e. 25 years) CD's that have (towards the outer edge of the CD) aluminum "flake" out from in between the plastic. I guess this is a form of "rot". None of my MFSL (24Kt. Gold CD's) have experienced this problem. Some of the older MFSL CD's are 25 plus years old. That may say something. Alternatively, I have experienced "digital rot" in a few of my Laserdiscs that I own. Granted, Laserdisc is inherently an "analog" format, so it's tough to do a comparison. Lastly, I have had a DVD (YES's "House of Blues") actually have the two layers of the DVD seperated to where the DVD player (any player I tried) would not read the DVD. many "West German Target" CD's"
To save you from that rot disappointment, please send those to me. They will only let you down. Picked up the Analogue Productions SACD and listened to it a few nights ago after a few absinthes. Outstanding. Took me on quite a syncopated spaceship ride. I'm doing a little informal comparison between the 45RPM Analogue Productions pressing versus my 1979 Japan pressing. The Analog Production wins hands down, although it does have a bit of background noise compared to the Japan pressing. As with most Japan pressings I own, it is dead quiet. I suppose there can be a bad apple in every bunch, but I definitely have none of the issues as posted by that individual on Audiokarma.